When beginning a kitchen remodel, it’s hard to know everything to consider, which is why if you employ a quality design-build firm, they can help you determine what items might be helpful for your lifestyle. We often have clients who utilize the following design elements into their kitchen remodel designs. Knife Drawers – especially for cooking aficionados, specific storage designated for your good knives is important. Spice cabinets – nothing can be more irritating than having spices fall out at you, when you open your spice cupboard. With a dedicated space for spice, not only does it feel clean and organized, but finding the oregano is easier than ever. Undersink U-drawers – while more expensive than a traditional drawer, under sink U-drawers utilize the maximum amount of space under a sink. Peg drawers for pans or dishes – easy access make this kitchen solution popular, though more expensive than a cabinet alternative. It can help keep items visible and eliminates damage from dishes and pans sliding around. This solution eliminates the need to reach up to put away dishes, so emptying the dishwasher can be quick and easy. Make sure to measure your dishes and the drawers to ensure you won’t have a lot of wasted space before utilizing this feature. Retractable stove vent – If you’re tired of seeing a large, stainless hood in kitchens blocking sight-lines to other rooms, a retractable stove vent may be right for you. Most often seen built in to a kitchen island, behind a cook-top, a retractable vent can be a discreet option requiring less space than a standard overhead option. Lazy Susan – can provide easy access to the back of a cabinet without having to move everything stored in front of the desired item. 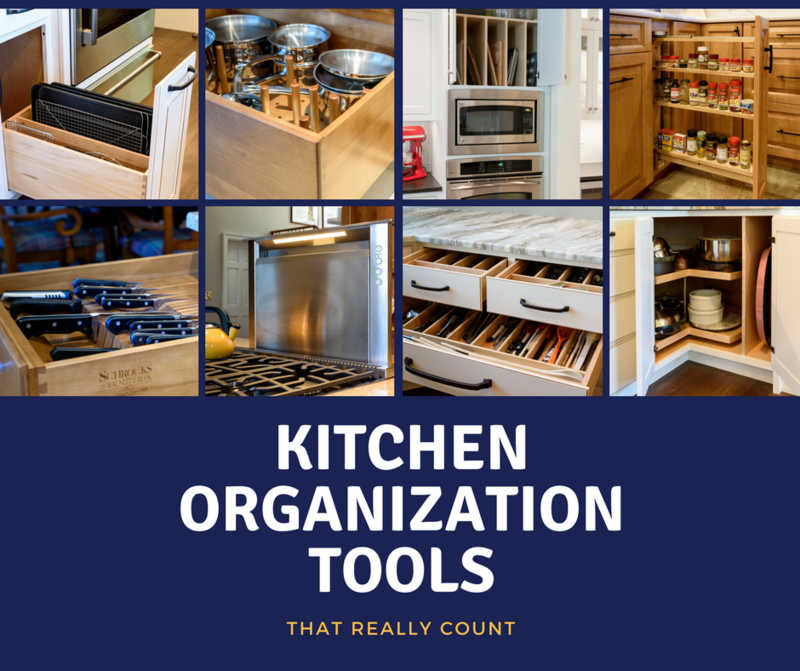 Cutting board and cookie sheet organization – we all have cookie sheets and cutting boards that can quickly become unmanageable without a dedicated location for storage. Our clients really like to have dividers in their cabinets to manage the clutter. Wine refrigerator – if you like wine, it can be helpful to opt for a built-in wine refrigerator. Not only are they an attractive element to your kitchen, but they can make entertaining a snap, with a chilled bottle of vino at your fingertips. Cookbook shelving – these are often a challenge for homeowners of where to store. If you have built-in shelves in your kitchen, these make a great location to store your favorite cookbooks. Appliance garage – a dedicated location to store your often-used appliances. 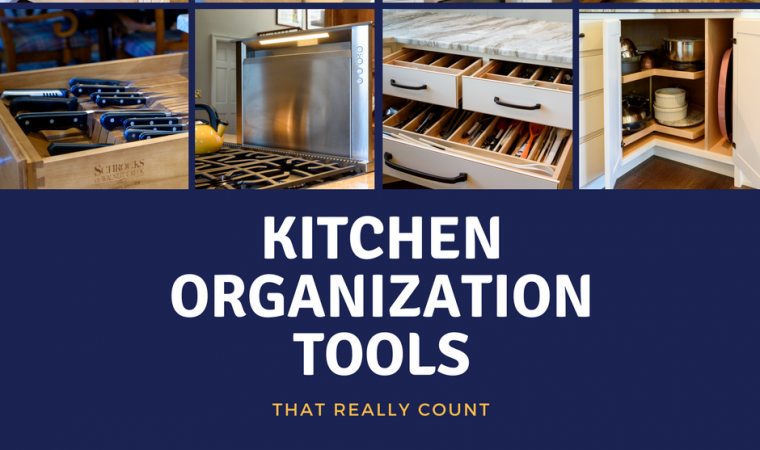 This great tool has a door that can hide the clutter that multiple appliances can bring to a counter-top. Business center – this handy station can serve as your desk and keep the normal detritus of life from settling on your kitchen counters. With the right design, you can keep filing, books, office supplies and more, right at your fingertips without the unsightly mess. Hidden outlets – you can place outlets within cabinets, in drawers and even find pop-out versions like these, to limit the unsightly outlets on your walls.